Just now I watched a Hindi movie "SWAMI" (2007). Directed by Ganesh Acharya and in main star cast there, Manoj Bajpai and Juhi Chawala. The story definitely takes you in 60s, 70s time line. I am so touched by the simplicity of the movie that I wept and wept till my heart stops. I was so spell bound after a single watch and ponder how a simple story can tell us the most vital thoughts of our life??? 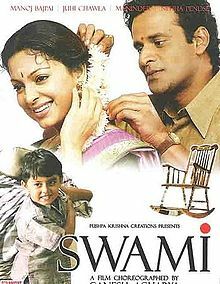 The story moves around SWAMI ( Manoj Bajpai), Radha (Juhi Chawala) and their only son Anand, living in a small village of Maharastra. Everything was well going until they have to move to Mumbai for the sake of study of their son. Radha had strong desire to make her son well educated and send him to America. There were ups and downs until Radha fell ill and left SWAMI nothing except memories of bounties of love and an arm chair that SWAMI loved the most. Then came the role of SWAMI to fulfill his beloved's desire. How he managed to win becomes the rest part of story. For detail story line please follow the link on IMDb. It is a very simple and not so well known story in modern commercialized cinema world, but surely very heart touching. The message of the story narrated by Amitabh Bachchan was like this, " Your loved ones when in their last phase of life can well see your future but they don't have enough time left to tell these things to you in detail." Ganeshji here very lucidly narrates the flow of emotions between two lovers who knows each other as seems from centuries. During the time Radha has to left this world she knew that SWAMI will be all alone in his life and nobody will be there with him except one arm chair that Radha had bought in expense of her treatment. Both loved each other at an extent that can only be fill and nothing to describe, simply to watch the movie. The belonging of Radha with SWAMI made him to live with her memories after her unexpected demise. The simple story has enough of it to bind you un movingly for the whole hour and bound you to think over your loved ones and how they loved you in their life and after. Really I am telling you from my personal experiences, your loved ones when leaving you alone in this earth they can see your future and tell you accordingly as much as possible for them. The love for you in their heart make it possible to all these supernatural things. They will never left you even after their demise and will there with you till the end. So folks what are you telling? Just now download the movie through the following torrent http://www.kat.ph/swami-2007-1cd-dvdrip-dv-madiha-t2284654.html link and re energies your emotions.